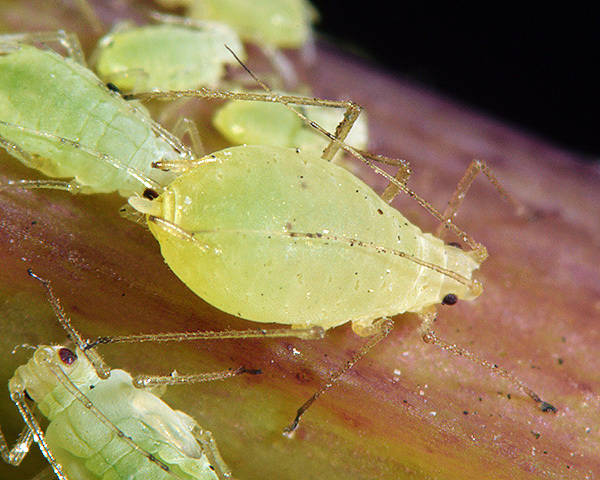 Hyperomyzus are medium sized aphids, the adult viviparae of which may be winged or wingless. The antennal tubercles are low and rounded. The antennae of most species are as long as or longer than the body. The abdominal dorsum is not sclerotic and in most species is not pigmented. The siphunculi are swollen. The cauda is finger-shaped, slightly contricted and blunt, and is shorter than the siphunculi. The alatae of some species have black dorsal markings. There are 18 Hyperomyzus species, some of which host alternate with currants (Ribes species) as the primary host, and various daisies (Asteraceae) and Scrophulariaceae as secondary hosts. Other Hyperomyzus species remain either on the primary host, or on the secondary host. 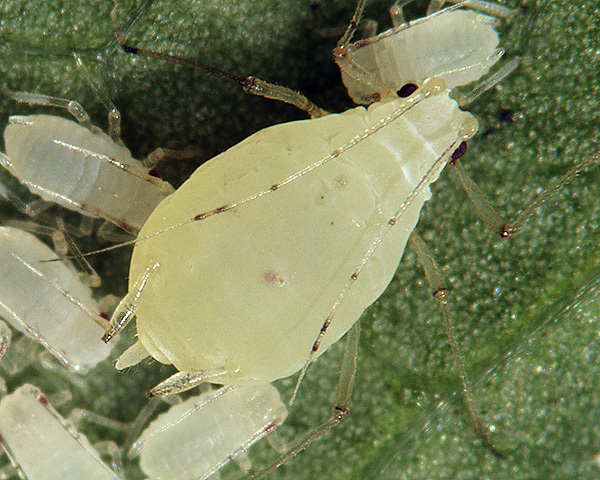 All species retain a sexual stage in the life cycle and overwinter as eggs, but oviparae and males are very rare in species confined to a secondary host. They are not attended by ants. 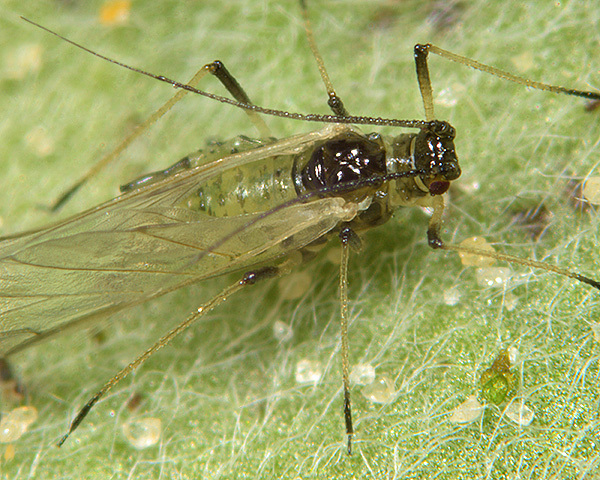 The adult aptera of Hyperomyzus lactucae (see first picture below) is medium-sized, broadly spindle shaped, and opaque green. The antennae of the aptera are quite long and pale, but the tips of the antennal segments are dark. The terminal process of the last antennal segment is 4.2-6.0 times the length of its base. The secondary rhinaria on antennal segment III of the aptera are clustered towards the base of the segment (cf. Hyperomyzus pallidus where they are more or less evenly distributed along the length of the segment). The siphunculi are pale with somewhat darker tips, 1.65-2.0 times the length of the cauda, and distinctly swollen. They are 4-7 times longer than the maximum width of their swollen part (cf. Hyperomyzus pallidus which has siphunculi 3-5 times longer than the maximum width of their swollen part) . The cauda is pale, shorter than the siphunculi, and finger shaped. The body length of wingless adult Hyperomyzus lactucae is 2.0-3.2 mm. The alate has a rather broken (fenestrated) central dark patch on the upper surface of the abdomen, shown in the second picture above. 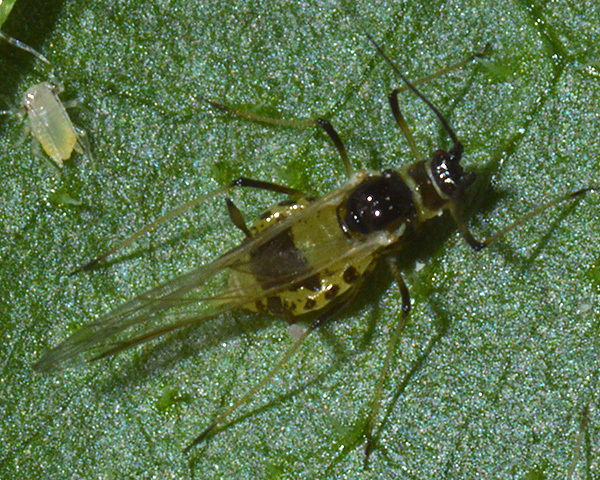 The blackcurrant-sowthistle aphid has a sexual stage in its life cycle, and host alternates from blackcurrant (Ribes) to sowthistle (Sonchus). Populations build up on currant in spring causing leaves to curl downward and stunting young growth. Hyperomyzus lactucae migrates to sowthistle in June, disperses between the summer hosts in July and August, and returns to currant plants in autumn. The species is widely distributed in temperate parts of the world. 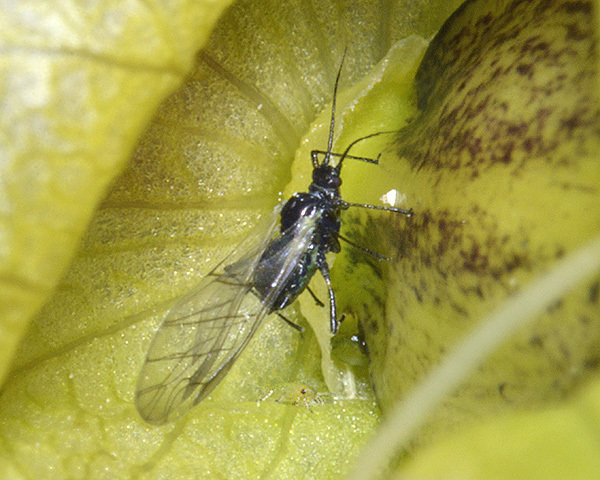 The aptera of Hyperomyzus lampsanae is whitish green. The antennae are mainly pale but with dark tips to the segments. The antennal terminal process is 7.8 to 9.7 times the length of the base of the 6th antennal segment. The apical parts of the femora are dark. The pale or dusky siphunculi are 1.5-2.0 times the length of the cauda and are markedly swollen, with the diameter of the swollen part of the siphunculus 1.5-2.6 times the diameter of the basal part. The body length of the Hyperomyzus lampsanae aptera is 2.5-3.5 mm. The alate Hyperomyzus lampsanae has a dark trapezoid-shaped central abdominal patch, and dark siphunculi (see second picture above). The ovipara is much like the apterous vivipara, but with the hind tibia swollen and bearing numerous scent plaques. The winged male is much like the alate female, but the abdominal patch is more or less broken up by pale areas, and the siphunculi are a little shorter. 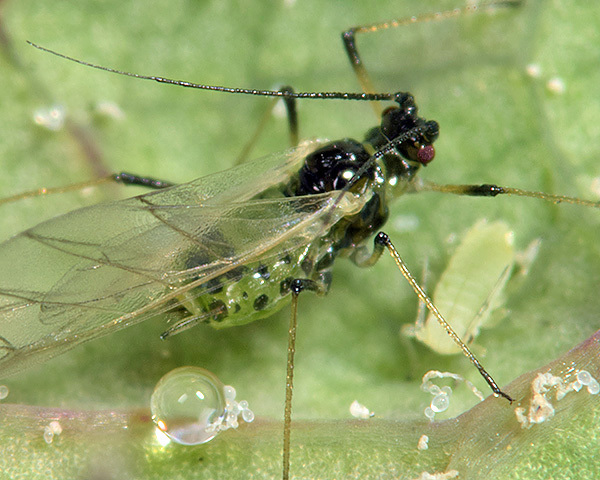 The nipplewort aphid does not host alternate but spends its entire life cycle on the undersides of the lower leaves of nipplewort (Lapsana communis). Hyperomyzus lampsanae is common in northern Europe and in Russia. Adult apterae of Hyperomyzus pallidus are opaque greenish or yellowish white (see first picture below). In our experience they are much paler on the secondary host (see second picture below) than on the primary host. 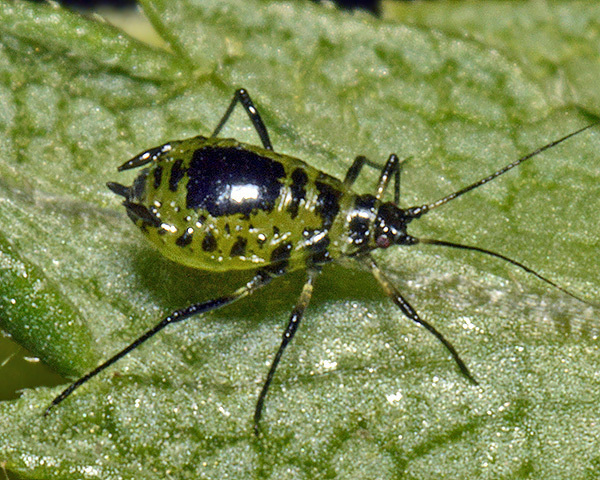 The legs and antennae are pale with dark apices to the segments. The secondary rhinaria on antennal segment III of the aptera are more or less evenly distributed along the length of the segment (cf. Hyperomyzus lactucae where they are clustered towards the base of the segment). 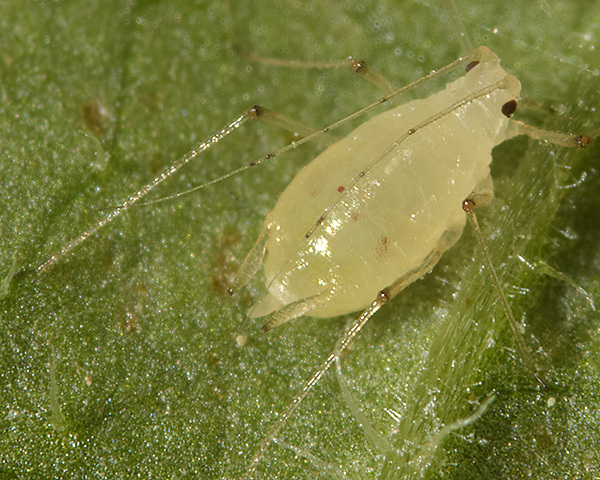 The hairs on antennal segment III are short, only about a quarter of the basal diameter of that segment (cf. Hyperomyzus lactucae where they are about a half of the basal diameter of that segment).The siphunculi are dusky-tipped and are 3-5 times longer than the maximum width of their swollen part. The swollen part is 1.6-2.4 times the minimum width of the basal part. The body length of adult Hyperomyzus pallidus apterae is 2.3-3.5 mm. The alate (see picture below) has blackish siphunculi and a more-or-less solid black dorsal abdominal patch (cf. Hyperomyzus lactucae which has a rather broken (fenestrated) central dark patch on the upper surface of the abdomen). 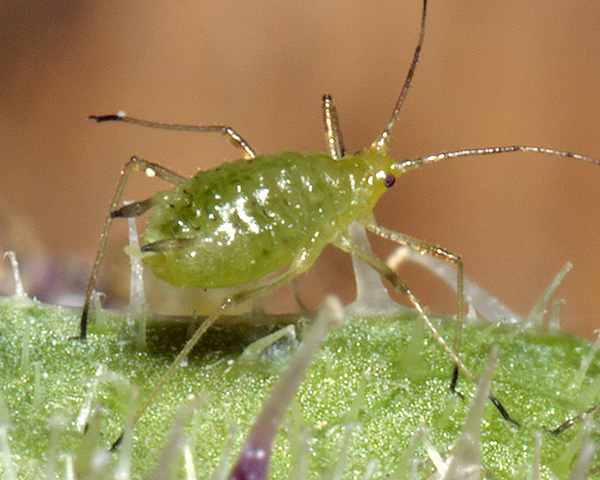 It has 50-75 secondary rhinaria on antennal segment III, 15-28 on segment IV and 0-9 on segment V.
The gooseberry-sowthistle aphid host alternates from the young leaves of gooseberry (Ribes uva-crispa) to the lower leaves of sowthistles (Sonchus spp.). Sexual forms occur in autumn. Hyperomyzus pallidus is found throughout Europe and in western Siberia, and has been introduced to North America. Adult apterae of Hyperomyzus picridis are shining pale yellow-green to dark green. The dorsum has variably developed brownish dorsal intersegmental markings as shown in picture below. The partially sclerotic dorsum distinguishes Hyperomyzus picridis from the related Hyperomyzus lactucae which has the dorsum entirely membranous. The fused last two rostral segments (RIV+V) are 1.45-1.8 times longer than the second segment of the hind tarsus (HTII). The siphunculi and cauda are dusky. The siphunculi are 1.5-1.6 times longer than the long slender cauda, with the swollen part of the siphunculi about twice as thick as the narrow basal part. The body length of Hyperomyzus picridis aptera is 2.0-2.8 mm. The Hyperomyzus picridis alate has a green abdomen with blackish green dorsal markings, mainly consisting of more or less broken cross bars . There are numerous secondary rhinaria on the antennae with 55-95 on the third antennal segment, 12-34 on the fourth, and 0-6 on the fifth. Hyperomyzus picridis host alternates from the primary host of alpine currant (Ribes alpinum) where it causes slight leaf curl to various members of the Asteraceae (Picris, Crepis and Rhagadiolus stellatus). Oviparae and winged males appear in October. Hyperomyzus picridis is widespread in Britain and Europe. Adult apterae of Hyperomyzus rhinanthi (see first picture below) are yellowish-green, green or dark green with extensive shiny black dorsal sclerotization. There is a large ovoid black central patch on the abdominal dorsum, cross bars on the other tergites, and postsiphuncular and marginal sclerites. Their antennae and legs are black except at their bases. The first tarsal segments all have 4 hairs (cf. Hyperomyzus hieracii which has 3 hairs on each of the first tarsal segments). The siphunculi are black and are 1.6-2.0 times longer than the rather thick cauda. The diameter of the swollen part of the siphunculi is 1.6-2.4 times the diameter of its basal part. Hyperomyzus rhinanthi alates (see second picture above) are dark green with the sclerotized parts black. Winged migrants in spring have 36-48 secondary rhinaria on the third antennal segment, 12-22 on the fourth, and 0-3 on the fifth. Winged migrants in autumn have 65-95 secondary rhinaria on the third antennal segment, 12-24 on the fourth, and 0-6 on the fifth. Hyperomyzus rhinanthi host alternates from red currant (Ribes rubrum) in spring to yellow rattle (Rhinanthus major) and eyebrights (Euphrasia spp.) in summer. 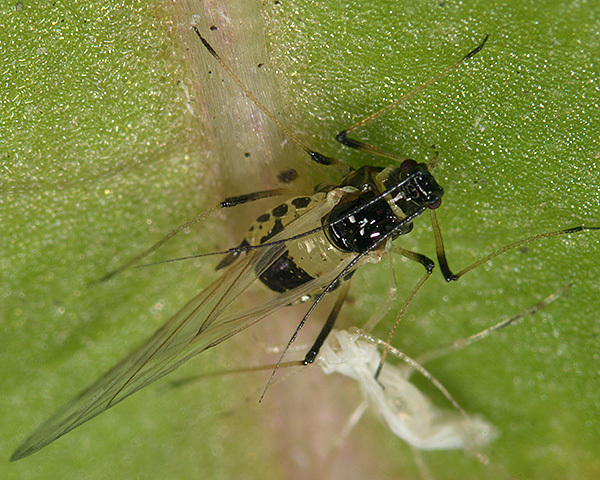 Oviparae and alate males develop in autumn. The species is found throughout Britain, but is reputedly more common in the north than the south. Hyperomyzus rhinanthi is widely distributed in Europe.